Specialist in VW styling and accessories. SWG Motorsport was established in 1992 and have gone on to become one of the UK's top styling and accessory companies. Here at SWG we pride ourselves on offering a range of VW body styling and accessories which have been designed and manufactured exclusively by us at our company headquarters. We specialise in products that are both unique and of high quality, indeed our products have been seen on some of the UK's and Europes best dressed VW's. So if you are looking for something special to enhance your pride and joy, look no further SWG Motorsport offer something different. 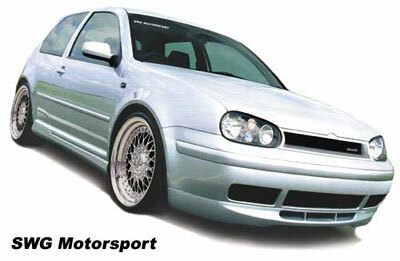 SWG offer a professional mail-order service, run by friendly knowledgeable staff who are avid VW enthusiasts. Our mission is to continue to design and offer unique products aimed at the decerning VW owner.